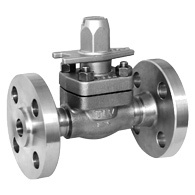 Gland packing proven in high pressure applications prevents external leakage. The inline scale removal function allows the removal of scale and dirt by operation of the valve, preventing clogging and reducing wear on the valve seat. See the instruction manual for details. Highly durable materials resistant to erosion and corrosion. Gland packing, valve stem, valve seat, and gaskets replaceable inline. High temperature and high pressure applications, such as steam trap bypass lines.